This video of Russian Armata T-14 tanks on parade appeared on youtube yesterday. Here is a roundup of tank related news from around the web. These articles come from a variety of sources, some better quality than others. Click on the headline to read the entire article. Malaysian army chief, General Raja Mohamed Affandi Raja Mohamed Noor, stated that the army plans to initiate an upgrade programme for its fleet of Alvis Vehicles Scorpion 90 light armoured fighting vehicles (AFVs) and Rheinmetall MAN Military Vehicles Condor 4×4 armoured personnel carriers (APCs) to enable them to continue operational service. As anti-tank threats are growing increasingly sophisticated, the Marine Corps is looking at protecting its ground vehicles with active protection and electronic warfare systems to fend off incoming rounds the same way ships and planes do today. Lt. Gen. Robert Walsh, deputy commandant for combat development and integration, said at a Senate Armed Services seapower subcommittee hearing on Wednesday that as technology proliferates, the anti-tank threat is rapidly evolving. The Navy is investing in protecting its ships and aircraft from similar threats, and Walsh said it’s time for the Marine Corps to take the same approach for its ground vehicles. MOSCOW (Sputnik) – Russia produces 70 percent of all tanks produced worldwide, producing one tank per day, Uralvagonzavod General Director Oleg Sienko said. “Today we hold 70 percent of the world market on tank construction. I mean tanks both produced in Russia and under our licensing in the world. We’ve held first place for several years already and aren’t willing to give that up,” Sienko told RIA Novosti in an interview. Prowling through a river, these are South Korea’s Black Panther tanks that can move effortlessly through 14ft of water thanks to a special ‘snorkel’. The £6million armoured vehicles were put though their paces in an underwater exercise across the South Han River in Yeoju, east of Seoul, today. With its snorkel system, the turret becomes watertight but the chassis can take in some 500 gallons of water to counteract the buoyancy caused by the air pocket inside the tank. The snorkel on top of the vehicle then serves as a look-out tower for the tank commander, keeping him above the surface. Tanks are being designed with controls that look like a PlayStation gamepad in a bid to encourage video game obsessive to join the army . The new British Challenger II’s firing mechanism is based on the Sony handset in order to make it instantly recognisable to new recruits. Army chiefs believe hours playing Call of Duty make gamers the best gunners and hope the new-look controls will encourage them to sign up. Lance Corporal Shannon Wood, who teaches recruits how to use tank weapons systems, told the Daily Star that the Army is keen to harness people with technological abilities in the war against terrorism. Jane’s has posted an article about how armor experts are sceptical over claims made by the manufacturer of the new Russian T-14 Armata that it is essentially invisible to radar. According to the article, the invisibility claim was made by the director of the Nizhi-Tagil-based UralVagonZavod (UVZ) plant, Vyacheslav Khalitov, on Ekho Moskvy radio on 3 July. Khalitov said the T-14’s hull is coated with special radar-absorbing paint and other materials and appliqués that make it difficult to be detected. The article quotes and unnamed retired US army flag-rank officer with experience in AFV development who states that “these claims would have to be proven. Placing heat-generating components ‘deep inside’ in the vehicle won’t help; modern thermal technology is very sensitive and when the tank is moved, or a weapon is fired, or a person is exposed, the thermal signature will light up. Plus, no matter where the engine is, when an engine big enough to move a 40- to 50-ton tank is fired up, it will have a signature.” The article also notes that Russian specialists familiar with radar signature reduction techniques said that most of the research in this area has been done with aircraft in mind and that the technology is not optimised for protecting ground targets. These pictures were brought to our attention in a forum recently. 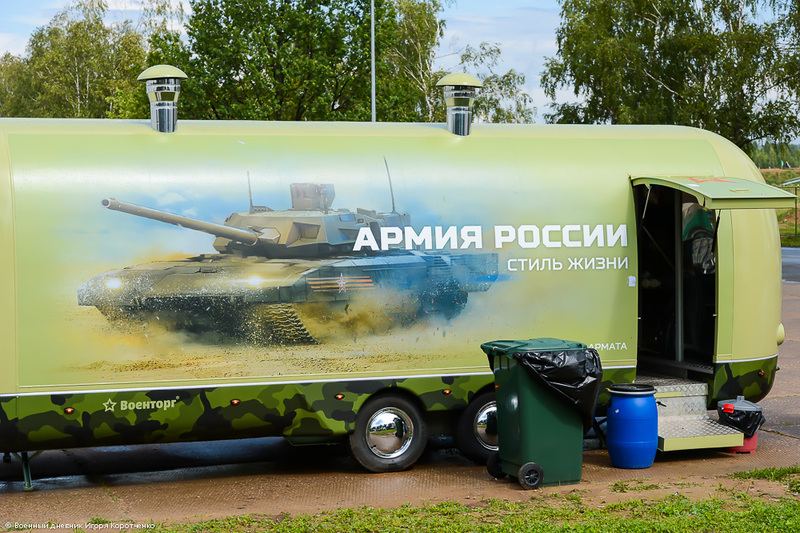 Apparently the Russians are so excited about the Armata that they are painting them on the side of food trucks? Anyone care to translate the text on the truck for us? International Business Times is reporting that the new Russian T-14 Armata tank will be showcased in September at the Russia Arms Expo in Nizhny Tagil. 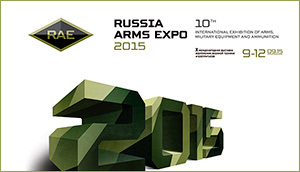 The expo will run from September 9 through 12, with the Armata being on display on the second day. According to the article, the manufacturer of the Armata noted “As for the demonstration of the Armata, we’ll certainly show it. This will be either a closed show or Armata will be placed behind a glass anti-glare contour.” The expo will run Sept. 9 to 12. Previous expos have featured 20,000 visitors, 470 exhibitors and delegations from 40 countries. 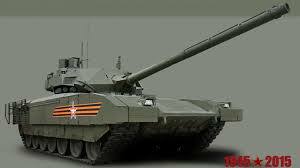 The Armata tank, which had long been cloaked in secrecy, will likely be a major draw. An article from ISH ETH Zurich by Joseph Trevithick attempts to deflate some of the hype surrounding the new Russian T-14 Armada tank, declaring it to be pretty “stale.” The author of the piece seems to be basing his conclusions on some comments made by noted tank expert Steven Zaloga, who is quoted as saying “A lot of this stuff is really stale” in regards to the new family of Russian armored vehicles displayed during the May Victory Parade. Zaloga is also quoted as saying that in the end “the Russians are not leaping ahead” and that “this is an attempt to catch up.” Considering the amount of media hype and nationalistic pride that the Armata has attracted, these comments from one of the worlds foremost tank and AFV researchers are bound to grab some attention. 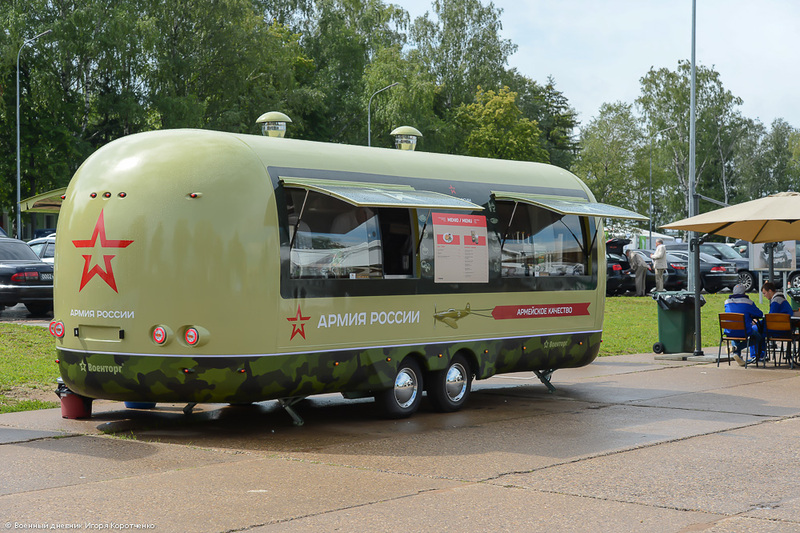 But despite these and other boasts, the Russia’s new fleet is much less impressive when compared to many Western designs, even some that are decades old at this point. The T-14 is lighter and not necessarily any better armed or armored than the American M1A2 Abrams, the British Challenger 2 or the German Leopard 2, according to an infographic originally specifications sheet made up by the Russian TASS news service. The specifications were later translated into English by the U.S. Army’s Foreign Military Studies Office (FMSO). Of course, both Moscow and Washington are generally tight-lipped about the exact details. In terms of armor protection specifically, the T-14 is probably no more impressive than the tanks Washington and Berlin have had in service for two decades now, based on educated estimates. And while Western engineers have generally focused on passive armor, the Pentagon and others continue to experiment with their own active protection systems. The Armata’s Afghanit system is also just the latest development in a series countermeasures the Russian Army has been using since the fighting in Afghanistan – an experience the new device’s moniker clearly references. Soviet commanders – like their counterparts around the world – have found active protection systems and explosive reactive armor can be very dangerous to ground troops near vehicles equipped with these protective measures too. As for armament, the range estimates for the T-14 seem generous. However, Leopard 2s can already hit targets at similar distances with the help of Israeli LAHAT missiles. Armata crews would probably have to fall back on gun-launched guided weapons when trying knock out enemies beyond some 5,000 to 6,000 meters too. Not that much of this matters, since the Russian sensors can’t necessarily find the mark much farther away. The “target detection range” is only vaguely “greater than 5,000 meters,” the TASS-provided specs said.